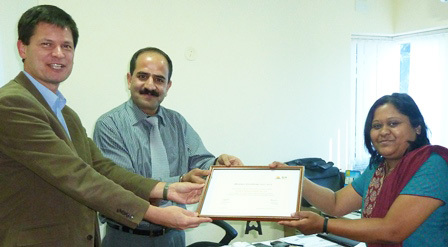 A representative of ISA today handed over their official membership certificate to the management of Toradex Systems (India). ISA is the premier trade body representing the Indian Electronics System Design and Manufacturing (ESDM) industry and has represented it since 2005. The organisation continues to play the role of a catalyst in the development of a vibrant semiconductor ecosystem by bringing together industry, academia and government agencies to further strengthen the cause of the Indian ESDM industry. ISA has a strong 170- member community to work towards the shared goal of making India a force to reckon with in the global electronics industry. Now as an active member of this elite community, Toradex Systems will be able to share and gain knowledge and insights to drive the future of the industry.